It’s nearly June. That means many things to many people – summer, school holidays, long evenings… and to some, Health Profiles. Since 2006, these summaries of health data for each local authority in England have been produced to support local authorities and their partners to make plans for improving the health of local people. Each year, Health Profiles are launched at the annual conference of the Local Government Association, which falls in June or early July. It’s never a totally stress free process, as there are always new issues to deal with, so our diaries for May and June are often busy. But the Health Profiles are a great example of how different parts of PHE come together to serve a common purpose. The data presented in the profiles comes from many different sources, including PHE (e.g. sexual health data used for the indicator on sexually transmitted infections), and outside sources (e.g. National Child Measurement Programme data for indicators on overweight and obese children). Each Health Profiles indicator is created by teams with expert knowledge of the topic, to ensure that indicators use appropriate statistical methods and properly represent the real world situation. The Health Profiles Project is led by a project board with representatives of Local Government and Directors of Public Health, to ensure that Health Profiles present useful information in a way that is helpful to users. Once the Project Board has decided how to present the indicators, PHE’s database managers and software developers create the profiles. The website team make the Profiles available, and press officers make sure that users are told about them. PHE Centres support partners in local authorities and health services in using the Profiles to assist conversations on local issues and plan how to improve health and reduce inequalities. Bringing together all this expertise in PHE enables us to use the right skills and relationships at each stage of the process. It’s a case of the whole being more than the sum of its parts. Furthermore, to ensure that PHE’s information and intelligence products address the needs of users, the Knowledge and Intelligence User Reference Group, has been established to bring together a number of senior stakeholder representatives (including the LGA, Health Watch, Department of Health and different directorates within PHE). This group will ensure that PHE prioritises work on information and intelligence products to meet the needs of local decision makers, by engaging users and listening to their requirements. assessment tools (eg the Segment Tool, which shows the contribution of different conditions to local inequalities in life expectancy). One of our current priorities is working on updates and improvements for the Local Health tool and the small area dataset which supports it. 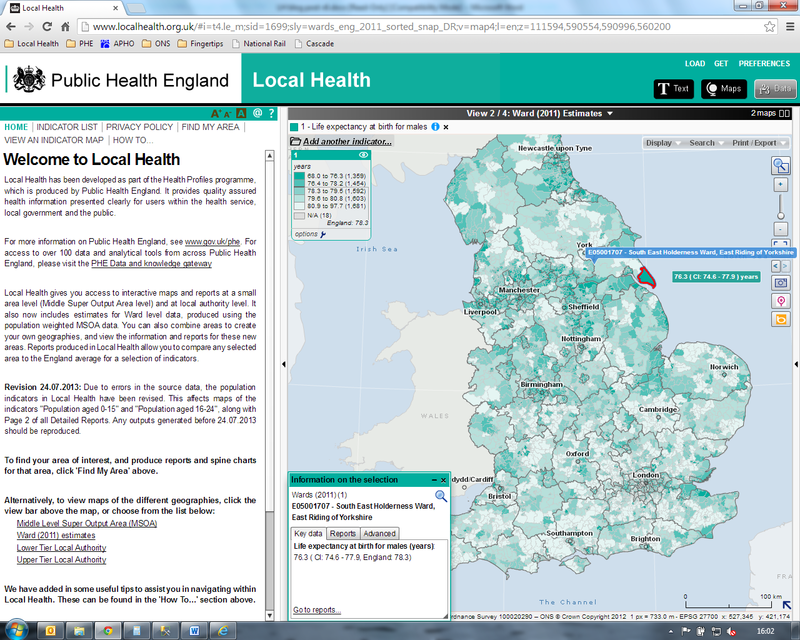 This tool presents information on health in each electoral ward in England, both as maps and as a report for the selected area. It also enables users to access data and reports for their own, self-selected areas, built up from the available wards. The Local Health tool was developed in response to requests from councillors and local voluntary groups, who are concerned with health inequalities affecting small areas that can be missed when information is presented as the average for a whole local authority. We want to make it as easy as possible for people to access the information they need, so will be consulting users on the content, presentation and user interface of Local Health. If you have a moment, we’d be grateful for your input via a short survey, or by commenting below. The 2014 Health Profiles will be released, and Local Health will be updated on 8th July and the team will be at the PHE stand in the Local Government Association conference. If you will be there, please visit the stand to see the new profiles and have a look at other products that may help in your work. I am a public health analyst working in the North East of England. As part of my role, I deliver workshops to make colleagues aware of the new tools being published by PHE, and help them to use the tools effectively. Attendees have come from public health, a wide range of other Council teams, partner public sector organisations and third sector groups. Experience from the workshops demonstrates that users find it quite tricky to navigate around the "Local Health" tool. Consequently I have created a user guide walking people through key tasks such as creating a detailed local area profile or a map showing local variations in a health indicator. It would be useful if a similar guide could be downloaded from the Local Health website. Better still, video clips could be created capturing the process of creating basic outputs. Thanks for your comment Andy – It’s good to hear you’re using and demonstrating Local Health. We’re keen to make using our tools as easy as possible, and have indeed produced a ‘How to’ guide for Local Health, along with accompanying video clips. To see these, click the ‘How to…’ link at the top of the text section on the left hand side. If there’s a particular topic you’d like adding to the list, do let us know via localhealth@phe.gov.uk. Thanks for the very helpful blog and I now know a little more about the profiles and the tool. I wondered if we have monitored who is actually using the tool and do the groups you have identified input from marginalised and vulnerable groups? I will try and have a ,look at the health profiles when updated 8th of July too. Bets wishes and thank you for the informative blog.